Ben Toolis is set to make his 50th appearance for Edinburgh Rugby tomorrow and he believes there is plenty more still to come for him with the Capital club. 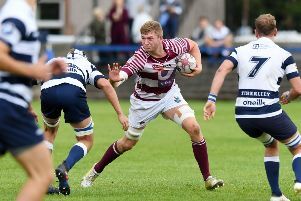 Having arrived at Edinburgh alongside twin brother Alex from Australia back in 2013, it took Toolis, a former volleyball player, some time to get used to the rigours of professional rugby. However, once the second-row found his feet, he hit the ground running and the 24-year-old second-row has become a mainstay of the pack. He has also earned one Scotland cap and is looking forward to taking on Harlequins in this weekend’s European Rugby Challenge Cup clash at BT Murrayfield (kick-off 3.15pm). “When I first came over I wasn’t sure how things were going to go, I just wanted to train hard and try and make my mark in pro rugby with Edinburgh,” he said. “If I do play on Saturday, I will be pretty proud because 50 games is quite a lot at this level. “Given my mum’s Scottish links I am sure she and dad will be proud too, but rather than thinking about it too much I just have to treat it like any other game. Harlequins will provide a much stiffer test to Duncan Hodge’s men than either Treviso or Timisoara Saracens have done in recent weeks.